NOTE: This is the compatibility list for Disney Infinity 2.0. 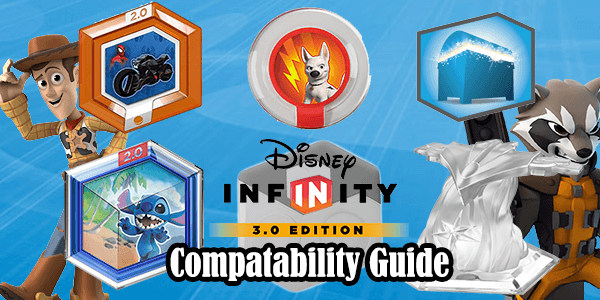 Looking for compatability for Disney Infinity 3.0? CHECK IT OUT OVER HERE! Welcome to Infinity Inquirer! Be sure to like me on Facebook and follow me on Twitter to stay up-to-date on all things Disney Infinity! With a game like Disney Infinity, with it’s assumed to be yearly releases, obviously a question that may will ask is… what is compatible? It’s a great question, and I want to make it as easy as possible. So I’m making this guide that will hopefully answer any questions you may have. While obviously many will question what items will be compatible with the new games, I want to start the opposite way. What systems is Disney Infinity 2.0 Compatible With? Disney Infinity 2.0 is available on the following systems: Xbox 360, Xbox One, Playstation 3, Playstation 4, and the Nintendo Wii U.
Nintendo Wii & Nintendo 3DS are not supported, and will not be supported going forward. There are also digital versions available for the PC and iOS platforms. Will the figures, power discs, playsets, etc. 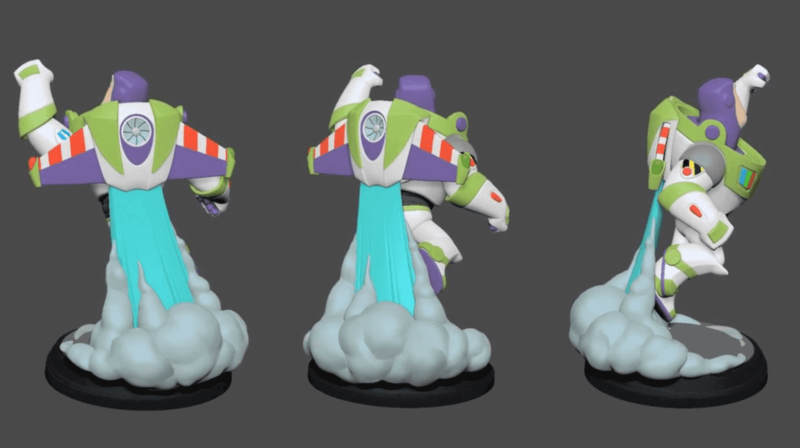 from Disney Infinity 2.0 work in Disney Infinity 1.0? No. Unfortunately if you want to play any of the new items from Disney Infinity 2.0. You will have to purchase 2.0. 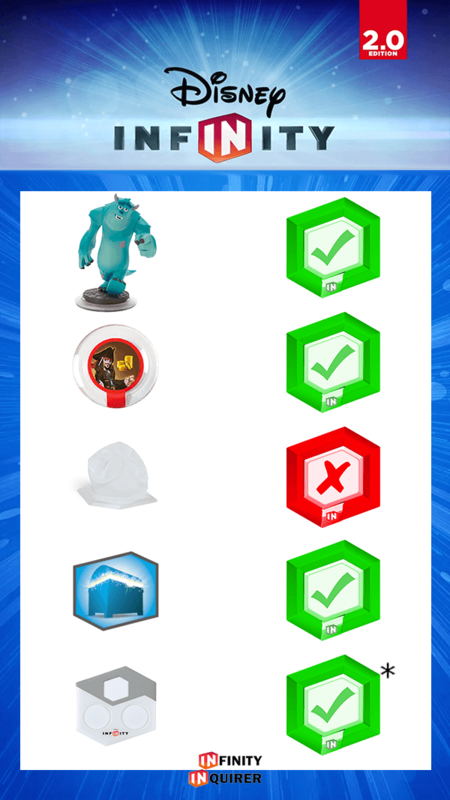 What items from Disney Infinity 1.0 will be compatible with Disney Infinity 2.0? Now is when the confusion will start. But hopefully this chart will help. Will figures from Disney Infinity 1.0 work with Disney Infinity 2.0? Yes! — If you remember your figure level is stored on the figure itself. So even your figure level will continue into Disney Infinity 2.0. Even if you switch platforms! Will power discs from Disney Infinity 1.0 work with Disney Infinity 2.0? Will playsets from Disney Infinity 1.0 work with Disney Infinity 2.0? Will toyboxes that were created in Disney Infinity 1.0 work with Disney Infinity 2.0? Will my base from Disney Infinity 1.0 work with Disney Infinity 2.0? Yes and no. This can be somewhat confusing, but I think it’s easiest to view the bases in three groups. Group A: Xbox 360 — this base only works with this system. Group B: Xbox One — this base only works with this system. So if you purchased Disney Infinity on Xbox 360 and want to get the game on a Playstation 4 or Xbox One, you need a new base. If you purchased Disney Infinity on the Wii and want to play on the Playstation 4, you do not need a new base. In other words, you will not need a new base if you are going to be playing Disney Infinity 2.0 on a console that is in the same bae ‘group’. If you’re playing Disney Infinity 2.0 in a different base group than you did on Disney Infinity 1.0, you’ll need a new base. Will I be able to play Disney Infinity 2.0 without having to purchase a Starter Pack? Yes! There is a digital download option available for select consoles. Are there differences between the Marvel Super Heroes Starter Pack and the Disney Originals / Toy Box Starter Pack? No! They both include the exact same software. You can still access the Toy Box mode in the Marvel Starter Pack, and you can still access the available Marvel play sets in the Toy Box Starter Pack. You could buy the Marvel Starter Pack and then buy all Disney figures. You could buy the Toy Box Starter pack and buy all Marvel figures. Both Starter Packs include the same Disney Infinity 2.0 software. Play sets are only playable by the Marvel figures. Will I be able to purchase the Toy Box Game Discs separately? Absolutely! The Toy Box Game Discs will be available in January 2015. Hopefully this helps! I’ll be adding to the guide as more questions arise, so if you think of any new questions, please feel free to ask in the comments so I can add the question into the guide! Be sure to like me on Facebook and follow me on Twitter to stay up-to-date on all things Disney Infinity! This only leaves the one big question – if our existing base will work with 2.0, how do we get 2.0 without a base? We’ve been getting the “digital download, stay tuned for more” answer since E3. Will the DD (digital download) include both Marvel and Disney Originals? If we get the DD, how do we get the playset? If get the DD, will we have to *wait* until a separate playset pack comes out? I mean, seriously. I just need to know how many of my less important organs I’m going to have to sell! Y’know, aside from those I’ve already parted with so that Sorcerer Mickey could mow down Zurg bots with a Tron disc! Depending on your system, I know that 2.0 can be purchased (for ONLY $20 I might add!) on the Playstation Network for both PS3 and PS4, I heard the same for the XBOX systems as well. I can confirm playstation since I just bought, downloaded, and installed 2.0 even though I don’t have 1.0. Plan on getting it now though! Please De- Confuse ,So now I’m confused as hell , I have the Wii, I understand that 1. The figures, Power disks and my Base will transfer into the new 2.0. So do I just need the 2.0 Disk ? or do I need to change my console.. Would I be correct in assuming that my (Wii) will not read the 2.0 disk. Correct. Disney Infinity 2.0 will not be coming to the Nintendo Wii. If you want to play anything Disney Infinity 2.0 you would need to upgrade to a Wii U or another console. Thank You for your help, oh well that’s me out, I’ll just have to be happy to stay with ver 1.0, I have all the figures and every single power disk + a lot of doubles, so I can get the use out of them. Can I use a Xbox one infinty 2.0 base on Xbox 360? Does this mean that If I have the ps3 console base I can use it for both 2.0 and 1.0 just need both discs? Also, if the ps3 console is compatible with ps4 why can’t i just play the 1.0 game set pieces on the 1.0 disc for ps4? what I want to know, is if I will be able to play 1.0 after the old characters get the 2.0 skill tree upgrade? Are the forward compatible items compatible across consoles? So say I have an Xbox360 for number 1 but I buy a PS4 for number 2, would I be able to get the Xbox360 stuff moved to the PS4, or would I HAVE to get an Xbox One? I just got the game yesterday! YAY! Will there be a disney 1.0 disk for ps4? I can’t find the answer to this question anywhere – will 1.0 ever be compatible with a Playstation 4? So then I can use 2.0 with my wii? No. 2.0 is not available for the Wii. Didn’t the above message say it’s interchangable with the other consoles? It says the base is interchangeable. If you want to get 2.0 for the WiiU or PS4 you can use your base from the Wii 1.0 game. Disney Infinity 1.0 has not been released for PS4 and it’s unlikely it will be at this point. However, all of the Disney Infinity 1.0 figures still work in the DI2.0 Toy Box. Gonna have to play on a last gen console or WiiU I’m afraid. I have the WiiU version of Infinity, but I have the PS4 version of Infinity 2.0. Is there any way of carrying the stats over from my characters? I can play as guest, I guess, but I’d rather just move them all over so I don’t have to start all over again. Will there be a WII version of 2.0 I know theres wiiu but wasnt sure if you can play it on the WII System? Disney Infinity 2.0 will not be on the Wii I’m afraid. this all fine and dandy if you have a console but what about Pc users? For Xbox 360 can you purchase a digital download for 2.0? My grandson got 6 new characters 2.0 for his birthday and we didn’t realize they wouldn’t work with the Infinity he just got for Christmas. Disney Marvels is split into two main parts – Play Sets and Toy Box. The playsets are story modes. You use the Avengers to fight Loki, Spider-man to fight Goblin, etc. You can only use 2.0 Marvel figures in these storylines. The Toy Box is a more open game where you make levels and then play on those levels. (You can also download new levels others have made). You can use ANY figure in this mode. Disney 1.0 figures, Marvel 2.0 figures, Disney Originals 2.0 figures. Everything is okay. Reading the compatability chart, I see we cannot use the play sets from Infinity 1 with the Infinity 2 software. Is it possible to have bother the Infinity1 and the infinity 2 software installed so we can go back sometimes to play the infinity1 play sets? Or does the infinity 2 downloaded software overwrite the infinity 1 software? I find it rediculous that you can’t play the story line game from 1.0 on the 2.0. Makes no sense and I feel like this was a complete waste of money. You already charge 14 bucks a character and 40 bucks to get a playset and now I can’t even play the game with them?! Cash Grab. I want my money back! Get a Wii U. 1.0 is a free download. Plus the Wii U has the best exclusive games and lowest price of any of the new consoles. I got the Wii U version when it was discounted, used the base from my kid’s game. Picking up 2.0 tomorrow for about $40. Can I ask a silly question if I buy infinity 2.0 while I’m on holiday in America will it work on my ps3 when I get home to the UK or is it like dvds only working in one country? The PS3 is region free, so if you buy games anywhere in the world the disc will work on any PS3 you put it in. I live in Japan and have a Japanese PS3, but I got Disney Infinity 2.0 in the US. The figures also don’t care what country your game or console are from. Does the 2.0.edition work on a regular wii? I am thinking about gettng a wii but if the marvel superheroes do not work on the wii, whats the point in getting a wii? 2.0 was never released on the Wii I’m afraid. It was released on the WiiU though, so if you get that you’re fine. Also, if you get a WiiU you can download Disney Infinity 1.0 for free. If you get 2.0’s starter kit on WiiU you can get both games. Read the tron figures article… i posted a video link that proves tron characters… i know its off topic but i want people to see it. Can I take my 1 or 2.0 figures from my 360 platform to a friends house when he gets it for the PS4? Yep. 1.0 and 2.0 figures will work in any version of Disney Infinity 2.0 on any system. Will I be able to get just the software for Wii infinity 2.0 to use with the Wii infinity 1.0 base or do I have to buy the whole new starter kit? I believe thestorm7777777 had asked something similar. Disney Infinity 2.0 is not available for the wii. Just the WiiU. My son has a wii – NOT a WiiU – do they make the 2.0 Marvel set for the Wii? We have been able to use all Wii games and controllers on the WiiU. All Wii games and controllers work with the Wii U!!! So I paid $19 and downloaded disney infinity 2.0 from the PSN storen because my son had damaged our disney infinity dvd. I checked on the official site that the characters he had Jack Sparrow, Monsters inc Sulley and incredibles would work, they came with the starter pack with the original game. Start the game, do the intro and then it says this character is incompatible with this version. So now what? Are these characters part of a play set which isnt compatible, even though it says theyre compatible with v2.0 on their website?!?!? Confused!!! They’re compatible… Playsets are not compatible. So you can use the figure in the Toy Box Mode, but you can’t play any of the playsets in 2.0. Sadly no. Check the section marked “Will my base from Disney Infinity 1.0 work with Disney Infinity 2.0? ” above. will the 2.0 work on the old wii? Nope. 2.0 is WiiU only I’m afraid. Sorry if this is off topic, but will a Disney Originals 2.0 playset work on the Marvel 2.0 portal/system, or will I have to buy both to play? I understand that all figures will work in the toy box, I’m only asking about the story play. Thanks! I want to know this as well, my son wants Marvel 2.0 for Christmas but also wants Disney characters 2.0 as well. I seriously don’t want to pay for BOTH games especially not at $75 a pop. We’ll also end up with 3 bases at this point which is just ridiculous…. Also will Disney1.0 figures work with Marvel 2.0? in the box, all of which can be bought separately. There isn’t two separate games, it’s all the same game. Just different way to access it. You can purchase the game/pieces how ever yo uwant. The bases are the same, the software is the same… just depends what way you want to go. If I don’t have 1.0 or 2.0 and my daughter loves frozen can I just buy the 2.0 and some frozen characters and she can play.? YES!!! All of the 1.0 figures will work on 2.0. You can buy 2.0 and play with ANY characters (1.0 or 2.0) in the toy boxes. So we purchased a used Wii 1.0 Starter Playset, that came with The Lone Ranger Play Set and the Side Kicks Set. When I get it can/do I need to reset the characters to factory settings so we can start from the beginning? Sorry if this sounds stupid but I really have no clue and read somewhere that your progress is saved to the characters. If we have the Infinity 1.0 base and software. Does the new marvel figures and play sets work on the 1.0 or does the 2.0 have to be purchased? That’s literally the first question answered in the article. Hasn’t the answer to this question changed since the software upgrade for 1.0 came available in November? my son wants Disney Infinity Marvel for his Christmas on Xbox 360, I have a younger daughter who has just started playing some computer games and I think she would really like the Incredibles and Monsters Inc aspects of the first release If we bought the Dinsney infinity 1 game and characters would it be compatible with the 2.0 portal ? (1) Can Disney 1.0 figures be used with either Disney or Marvel 2.0 games? (2) Can you play Marvel figures with Disney 2.0 Toy Box game or Disney figures with the Marvel 2.0 Toy Box game? (3) Can you play Marvel or Disney 2.0 figures with the 1.0 system? If I get the starter kit for ps3 and just the game disc for ps4 will the base for the ps3 work with the ps4? In other words, you will not need a new base if you are going to be playing Disney Infinity 2.0 on a console that is in the same base ‘group’. If you’re playing Disney Infinity 2.0 in a different base group than you did on Disney Infinity 1.0, you’ll need a new base. From what I understand the figures do but play piece doesn’t so can we play with the figures ?? If you buy the 1.0 playsets you mean (Cars, Lone Ranger, Toy Story)? Playsets do NOT work, figures do work. Great site! Just bought 2.0. Excited to play with my son. Can I still play 1.0 play sets if I buy 1.0 starter pack later? The game data saves to the character pieces? And am I correct in thinking that my Cars play set piece will automatically give us access to all characters, etc in 2.0 you unlock while playing the 1.0 play set? Do you think they will one day allow us to play all play sets with whatever the latest version is or for some fee? Answer your last question first, no I do not. There is too much of a technical challenge to bring the playsets with version of the game. It just won’t be a fluid or enjoyable experience. It’s just better to keep your old discs/platforms. by consumers purchasing the upgraded version as well as consumers STILL having the ability to utilize their 1.0 PLAY-SET WORLD PIECES including: Cars, Incredibles, Lone Ranger, Monsters University, Pirates of the Caribbean, and Toy-story. The 1.0 EDITION: Base, Power Discs, Toy-Box items, and Characters ARE interchangeable with BOTH Disney INFINITY versions. THE PLAY-SET WORLDS are NOT! Playsets have nothing to do with the bases. It has to do with the programming in the game? I don’t really understand what you’re saying? I am frustrated that the game is not available for the Wii. Our Wii works just fine & I have no plan to spend another $400 for a new game system. My kids love these types of games, including Skylanders, but not everyone wants to upgrade to a new system. @lesleykernerslaymaker:disqus & @gracefordwuensche:disqus unfortunately the Nintendo Wii is an outdated platform. It was already years behind (technology wise) when it was released alongside the PS3 and Xbox 360 EIGHT years ago. Eight years is an ETERNITY ago in the tech world. If you look online at new games coming to the Nintendo Wii, there may be at most 10 games (if that) in the next year. The same thing will happen to the Xbox 360 and PS3 in the next 2 years. Thankfully systems like the Wii U can be purchased in a nicer bundle deal to save some money. Online via Xbox 360 STORE, you can purchase the 2.0 Edition; avoiding the additional charge for the base and characters. However, only Marvel Characters will work on the Marvel Play-set World. The Toy 2.0 Toy-chest allows all character play. Can I install and play Disney infinity 1.0 and 2.0 on my Wii U? Could I go back and fourth from each version? Please help. I bought both starter packs and now am unsure if my daughter will be able to use both. hi there. i have brought the disney infinity marvel 2.0 starter pack for my PS4. My daughters will want to use the disney figures such as maleificent and tinkerbell. will they work on this game? am i right in thinking the characters will work but the game software will be still marvel related? Hi! Does the disney infinity for 3ds work with 2.0? Thanks!!! We have a Wii, NOT a WiiU, so will the wiiu product 2.0 infinity marvel work on our wii? Or is there a set that is fitted just for the wii? I have the old Wii and want to buy Disney Infinity/Marvels Infinity for my boy to play, what version can I get – its to confusing! Read the very first question. I have a Wii, and purchased a Disney Infinity Starter pack 1.0 last year…can I buy Disney Infinity 2.0 characters to use on the Wii or do I need the starter pack first? Both questions are answered in the article. 2.0 is not supported on the Wii. Quick question… a relative bought the kids the PS4 Marvel Starter kit. We have a Wii U. From reading above, the bases are compatible between PS$ / Wii U. How about the game disk that comes in the set? Would like to try and see if this works prior to opening… If this isn’t an option… Can the game still be downloaded / and at what price from the Nintendo eGame store through the console? Obviously the discs aren’t compatible as they are for different systems. So if I buy (or download) 2.0 on my Xbox 360, does that mean I no longer own 1.0? Can you still play 1.0 and 2.0 separately, or will your playsets on 1.0 no longer work at all? It’s no different than if you bought Call of Duty and Halo. They’re two separate games. So I’m trying to locate rare 1.0 characters, If I live in the US with a US system-will characters shipped from UK work on our system? I have Wii 1.0 base and tons of figures… we bought my son an Xbox One for Christmas. What do I need to buy to play Disney Infinity and use the figures that we already have? What’s my cheapest option? (sorry- if this is a stupid question- I’m completely in the dark about this stuff). You will need to purchase a new Starter Pack. Cheapest is the Toy Box Starter pack, but the Marvel starter pack is the better value. NOTE: The Disney Infinity 1.0 figures will only be valid in the Toy Box Mode in 2.0. Can anyone tell me if the crystal versions are good buys and offer anything really special and unique other than being cool looking? Our sons, ages 8 and 5, have asked for Disney Infinity for Christmas. What exactly do I buy? We have an XBox 360. I have seen Marvels kits, a Toy Box kit, and lots of little figures that are for Infinity. Which kit do I need and can I use, for example, a Phineas figure in a Marvels kit? In short, what do our boys need to receive on Christmas morning so they can say they got Disney Infinity? Hi! Please help! I am brand new to the Infinity Community! My 6 year old very girly daughter has asked for Disney Infinity for Xmas, after playing it at a friends. She especially wants the Jessie and Elsa figures, and also loves Merida!! I was going to buy the 2.0 toybox starter pack, Toy Story play set and Elsa figure, but have been told that the play set wont work on this? Whilst the characters will work in the toy box mode, the toy story game wont work? Is this correct? Am I better off going for a 1.0 starter set? I am so confused!! Will the infinity 2.0 wii u work with the wii mini? Help! We have an original Wii (not a Wii U). Is a 2.0 version available for the Wii or will we need to buy the Wii U?? 2.0 is not available for the Wii. Will 2.0 ever be available for Wii? My son purchased the infinity game through the XBOX 360 Microsoft Live. Is there any way to just the toy box without buying the game again? Please answer as soon as you can; is the Disney Infinity 2.0 system compatible with the regular Wii, and not Wii U? I can not purchase a Wii U just yet, and do not have any other systems. Please advise, thanks! As stated in the article & in the comments… it is not available on the Wii. Is the 1.0 version compatible with the regular Wii? okay…I’m dumb with this stuff…so simplify this for me..
we have the infinity 1.0 on PS3…do i need to purchase anything OTHER than the software download to let the youngling play all facets of the 2.0? …would like to know before christmas…No Pun Intended.. The original “compatible” 1.0 characters for say the PS4 will work with the 2.0 version of the PS4 without having to buy new characters right?… So I own almost all the physical characters from 1.0 for the Wii. Can I use the Wii base to add my 1.0 compatible physical character to the PC 2.0 without having to repurchase all the same digital character that I already own? And if not is there a patch coming in the near future that will afford me the same opportunity to use my already purchased characters as with other consoles? Figures are cross-console. You can use them on whatever console you want. PC/iOS figures are enabled via the codes on the cards you get in each figure pack. So Happy I found your site!! Will definitely return to it often to review any new Disney Infinity information… Quick ? I’m trying to determine what would be the best option for our family to upgrade to 2.0. We would still be playing on the same Xbox 360 system and currently own the 1.0 version of the game. If we upgrade our 1.0 base to 2.0 via download, will we still be able to revert to 1.0 after the upgrade and play our old 1.0 play sets when we choose to (kids are not ready to give those up yet)? Will the upgrade create a separate 2.0 log in, or should we just purchase a separate 2.0 starter kit? Thanks again for all the great info! It’s just like if you were purchasing a new video game all together. Nothing happens to your old game. can the starter pack for ps4 work with Wii U? We have a Wii mini. Will 2.0 starter pack work with it? Purchase the download from the eShop on your Wii U or purchase a new Starter Pack. Ok. So i am new to all of this. I have got my son a wii u console for christmas. Whilst shopping one day i got the disney infinity (not the 2.0) on special and the characters. Can this be played on the wii u or do i need to return it and get the 2.0 version? Did you get the Wii U version? I purchased an Avengers 2.0 S.P. for my daughter for Christmas. Can we purchase 1.0 characters and will they work with the 2.0? I am finding more 1.0 characters that she and my son would enjoy. I have the marvel starter pack that I bought along with the xbox one. But i would like to be able to play in the disney original playsets too. I was wondering if I buy the starter pack with sulley and the others for xbox 360 but use the inginity base I have now, would that work? Because the first starter pack came before the xbox one. If that doesn’t work are there any other options? Xbox one isn’t compatible with Xbox 360 games, so no. Get them for Xbox 360. They won’t be added. I am new to all this and am confused as I haven’t played anything yet! My girl likes princesses and I want to buy her something from the infinifty range for xmas. Do I buy the 1.0 version (because it seems to have princess characters) or do I buy 2.0 version? Please talk very simply coz I don’t know what a ‘playset’ is! Will I have to purchase a 2.0 starter pack if I already have the Disney Infinity console for the Wii? And also, are the 2.0 characters compatible with the 1.0 console? Can four people play on one system by connecting two bases, or is the four player option only available through online play? I bought Disney infinity 2.0 starter pack for the Xbox 360 but accidentally bought a the Spider-Man figure for the PS3, can I use this figure on the Xbox 360? There is no such thing as a Spider-Man for PS3. Figures have no “console”, they’re cross console. I have Disney Infinity 1.0 for my Wii. To have the 2.0 game, would I have to buy the starter pack?? Hello by mistake my husband bought the PS4 Disney Infinity 2.0 but my son has a PS3. Will it work on his PS3? We bought Infinity Marvel 2.0 wii U for our daughters and we bought a bunch of Disney figures for them to play with. We also bought the play set crystal from Infinity 1.0 because we wanted to be able to play those original play sets. But it did not work. I saw now that it is not because the crystal was defective. It seems it is not supposed to work on Infinity 2.0. Is there a patch or a download that we can do in order to have those play sets (cars, toy story, pirates of the Caribbean)? I’m still confused about the differences between the Toy Box Starter Pack and the Marvel Starter Pack. You say there is none, but it looks like each comes with two different games or modes or whatever they are called that are specific to each package? Is that not the case? I understand the software itself is the same. But each has something with a specifically named game that the other does not have. Marvel Super Heroes includes 3 figures and a playset, Disney Toy Box includes 2 figures and no playset. So, I bought my son the original starter pack for his Wii Mini for XMAS last year… Will I be able to purchase the Marvel starter pack 2.0 for his Wii Mini this year? As stated in the article, no. Ok, I have 1.0 and I want 2.0 , so can I just buy the game disc with some figures and play on the 1.0 toy disc? Thank you for this! We are about to buy 2.0 for XBox 1 and have 1.0 for 360. We wondered what would work with what system. Thank you for making this all totally clear! I have a quick question. I just bought the marvel set but I don’t have the orginal Disney Infinity yet. Would I be able to get the orginal game and use the 2.0 base for it without having to buy the 1.0 base? Is there a way to get the Wreck-It Ralph Playset on 2.0? Even if it is just a download or something. There is no Wreck-It-Ralph playset in the first place? Yes. just put the piece down. Is there any way to convert or add an adapter so our daughter can play 2.0 games on our original wii with the 1.0 game? We don’t want to have to buy a whole new system just so she can continue with the game. My son has a WII, are any of these 2.0 versions Tow Box or Disney available on the Wii…or do I have no choice of purchasing a new console? Will the xbox 360 portal work on ps3? We have an Xbox 360 with the marvel starter kit. I accidently got the brave/stitch Starter kit for the PS3. Can I use the figures from PS3 for the xbox? Just in case the store won’t return or exchange. After reading above I see I only needed to buy Disney figures instead if the whole starter kit. Hopefully I can make an exchange! I think it stinks that I payed money for the first infinity game….then you upgrade to the 2.0….I have to purchase the new starter pack… and it won’t even work on my current system….I have to again purchase another wii….U!!!!! Digital figures only work on the PC/iOS versions of the game. Console versions require the physical figures. Hi just got the marvels starter pack. Finding it very fun. But worried that i also got some characters from Disney. would i be able to play with all of the figures? on the marvel pack. 2.0 is the one im talking about i think. There is a digital option, as explained in the article. So pretty much the people who purchased Disney Infinity for the Wii or 3DS are the only ones who are stuck and can’t upgrade to 2.0? And the only way to do that is to buy a new system and a completely new Infinity Starter Pack? My son just got it for his Wii for Christmas and I’m wondering if we should just return it. We don’t have any plans to buy a new system anytime soon. And not sure if we’ll still be able to find the 1.0 figures as such. Really bummed about this and wish they could let Wii users upgrade without having to buy a new system. The Nintendo Wii and 3DS are not powerful enough for Disney Infinity 2.0. In fact there will be less than 5 games released total in 2015 for the Nintendo Wii. By 2016, I doubt there will be any games released for the Nintendo Wii. The Wii U is backwards compatible with the Wii, so if you upgrade to a Wii U, everything you currently own will work (including the 1.0 disc). If I own the 2.0 360 version, can I download the 2.0 ps3 ver and use the same base for both consoles?? So rather than post a response at all, much less one with an answer in it, you just deleted my entire response. Seems to me your afraid of your own mistakes and inability to manage an informative site! Do you have a response this time? Or would you prefer to actually answer the, apparently simple, question I asked to begin with?? No… Your comment was in moderation. Secondly… Group A: Xbox 360 — this base only works with this system. So no, its not interchangeable. You need a new base. No worse than your inability to read. We got the 2.0 for xbox one and had the 1.0 for our old Xbox 360, to play the Incredibles play set on Xbox one do I need to buy the whole started pack of the 1.0 for Xbox one or just need the game disc? You unfortunately will not be able to play 1.0 on the Xbox One. Is there any difference between the portal that came in my kid’s 1.0 box and the portal that is being sold in the 2.0 starter kits? or are they just being sold because they expect mostly new people to buy those boxes? Oh and a disclaimer on my user name-my daughter did that and no, I do not think I’m better than anyone. Now to figure out how to change that. OK question. I have a wii U with infinity 2.0 and base. My son has a xbox 360 and would like to play infinity 2.0 on his 360. Will a Wii U base work on the xbox? I know the article says that Xbox bases are only for that system, but will the C group work on the Xbox? Despite Disney’s official denial of not discontinuing products, I’ve noticed some figures, such as Violet, Randall, Syndrome, and Mrs. Incredible, are nearly impossible to find in stores now, and a lot of stores no longer even list them on their websites. However, the UK editions are still available on Amazon. Will these figures (and Web Codes) work on US versions?